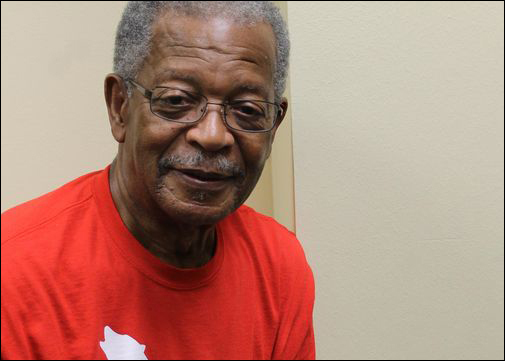 Ruston, Louisiana resident Otha Anders started saving his first penny more than 45 years ago when he found it on the ground. The coin reminded him to pray and give thanks. Fifteen five-gallon plastic water jugs and half a million pennies later, Anders on Tuesday deposited $5,136.14 into his account to go toward a recent dental bill. He cashed in the coins to the Ruston Origin Bank. After that first coin, Anders said his penny pile began to grow and he ultimately stopped spending pennies and always made sure whenever he made a purchase, his change contained at least three to four pennies. Bank Vice President Jennie Cole said it was not a typical day at the bank when Anders had his collection of pennies rolled in on a dolly, but Anders is a longtime customer who they wanted to help. Cole said a machine counted the coins that saves much time, and Origin Bank’s part is to help get the pennies counted. Cole said the bank will then send the pennies off to the FDIC, and the bank will receive their credit for them. As a supervisor for in-school suspended children for the Jackson School Board, Anders said his students learned about his penny fascination and would save them up to sell to him. Anders said he has truly enjoyed looking at his penny collection to the extent that in the 1970s, when the U.S. government offered a $25 bonus for every $100 worth of pennies turned in, he refused to cash in his collection. Five of Anders’ closest friends and family helped him and bank employees load the coins from the back of a pickup truck into the company’s coin room. During the five-hour process of counting the pennies, the plastic jugs were hacked open with an ax and hammer. The pennies were then poured into the coin machine with small plastic buckets. Anders sat next to the machine watching his collection go down the counter and the bank workers come in to the change the coin bag every 20 minutes, since the coin machine bags need to be changed after every $50. Anders said he would be truly remiss if he did not acknowledge his friend, Jack ‘Domino Kid’ Brown, for helping him with his penny collection. He said Brown could only redeem his nickels with pennies and he could redeem his pennies only with nickels. “Our exchange became competitive by each trying to outdo the other and consequently our collections; his nickels, my pennies began to multiply,” he said. But now, since Anders homeowner’s insurance policy does not cover his collection, he has reluctantly turned them in to Origin Bank.